Social Login for Vanilla Forums is a professionally developed and free plugin that allows your visitors to login and register with 40+ Social Networks like per example Facebook, Twitter, Google, LinkedIn, PayPal, LiveJournal, Instagram, Вконтакте or Yahoo amongst others. Social Login is fully customizable and seamlessly integrates with your existing login/registration system so that your users don’t have to start from scratch. Existing existing accounts can add/remove their social network accounts in their profile settings and then also use the linked social networks to login. Do not take the risk of losing any users or customers due to outdated social network integrations. Unlike other Social Login providers we monitor the APIs and technologies of the different social networks and update our service as soon as changes arise. Feel free to fork our GitHub repository to contribute. 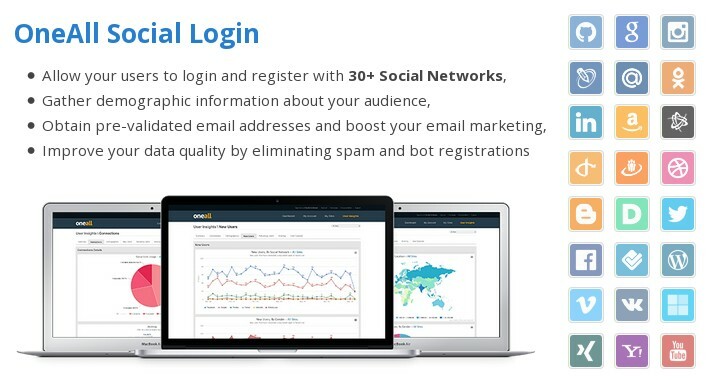 Social Login is maintained by OneAll, a technology company offering a set of web-delivered tools and services for establishing and optimizing a site's connection with social networks and identity providers such as Facebook, Twitter, Google, Yahoo!, LinkedIn, Paypal, Instagram amongst others.